The patented Stealth Tower is designed to provide active linear perimeter coverage utilizing multiple, interlaced IR beams projecting 660’ (200m) in each direction. The patented Stealth Tower is designed to provide active linear perimeter coverage utilizing multiple, interlaced IR beams projecting 660’ (200m) in each direction. The beams may be directed up to a 90° angle to allow corner placement of the tower. The tower is named “Stealth” due to its black color and the ability to blend into fence lines and foliage when viewed from a distance – making it almost invisible. Available in six or ten foot heights and when deployed at maximum range, approximately nine towers will provide one mile of perimeter protection. Stealth tower technology is TSA Safe Skies reviewed and patented – meeting some of the most demanding thresholds of security performance. The towers completely enclose and protect from the outside elements all internal sensors, batteries, and assemblies ensuring long-life and sustained performance. 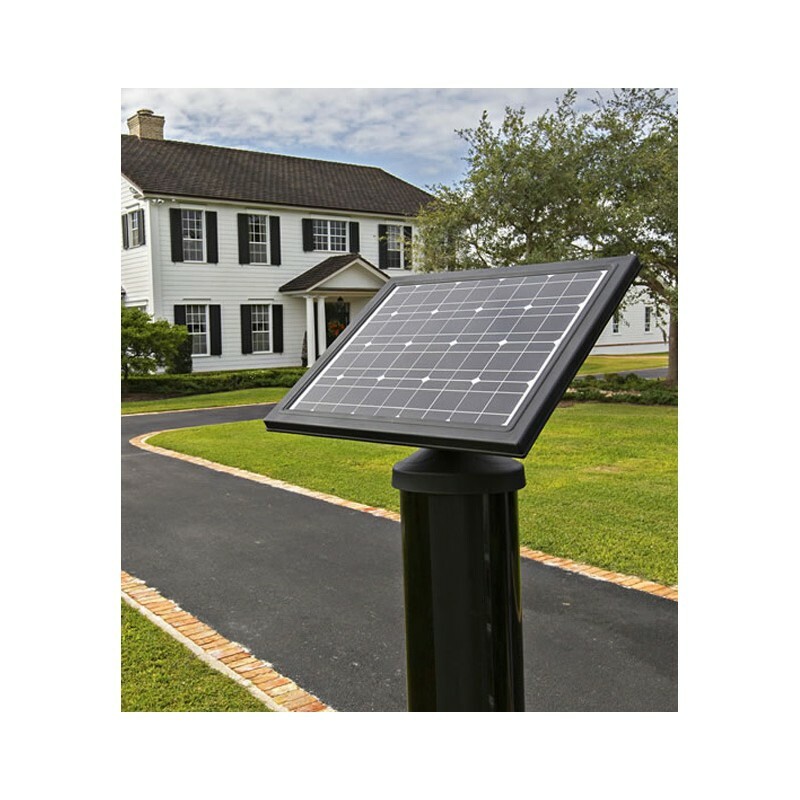 The solar powered stand-alone towers are polycarbonate and Lexan construction, making them free from EMI and RFI issues, electrical surge concerns, and include a lifetime lightning warranty – making them ideal for use in electrical substations and industrial applications. The towers mount directly to a 250 pound concrete pedestal base, with Solarbeam providing molds or pedestals as desired. 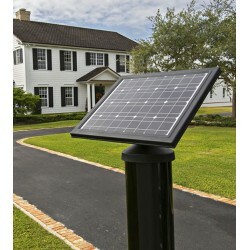 Four specially made 12V gel batteries provide power to the sensors and solar power recharges the batteries daily. In southern climates, an average of five hours of sun daily is required for full charging and Solarbeam provides solar calculations for all regions. The Stealth tower is also available in a powered (AC) version with battery backup, should electrical power be convenient at the installed location. Stealth towers can operate a minimum of 5 days without recharging and usually provide 7-14 days of uncharged operation. A solid-state internal controller inside the tower provides remote diagnostics to include beam health, beam trips, solar charging state, and battery status. Secure wireless radios or secure cellular provide data directly to the user, security suite, or alarm panel – with perimeter beam trips being a simple I/O report. This allows users to receive notification as desired and without incurring large data charges or bandwidth issues. Should your security needs change, towers are easily relocated ensuring long-term value in your purchase. Finally, Solarbeam has hundreds of Stealth towers that were installed ten to fourteen years ago and still standing guard with only minor upgrades.